In a previous post, we looked at Vulcan Industries’ creative design process, which begins with asking clients the right questions and listening to their feedback. The next step involves collaborating with the client to come up with and refine a concept that addresses their needs. But the phase following that is where the magic actually happens, where the product is brought to life and goes from being an idea to a tangible solution. This month, we talk to Vice President and General Manager William Hudson and New Product Development Manager Jim Bell, about the nuts and bolts of arguably the most important part of what we do at Vulcan. Q: So exactly how does Vulcan go about engineering custom retail display solutions? Jim Bell: Our Product Development Team gets a project request from the sales team which includes the initial displays designs, a detailed explanation of the display requirements, product to be displayed, and customer expectations. From this information, we develop a display solution that will fulfill the design expectations as well as the structural features needed to support the product. Using Pro Engineer design software, we develop CAD models of the display and engineering drawings for estimating and manufacturing. Q: What sets Vulcan’s engineering apart from that of its competitors? Jim Bell: We have a team with over 90 years of display experience. Many of those years of experience are at VI. We are a mix of mechanical engineers and industrial designers, so we bring knowledgeable engineering practices as well as human factors and aesthetics to the design table. We also employ a mechanical engineer in China to develop designs for China production and assist with our quality control process for our Chinese vendors. And within our facility, our engineering team manages a shop that builds short-lead-time samples for the sales team to present to customers. Q: How can partnering with the engineering team benefit the client to produce a superior end product? Jim Bell: Each project engineer works directly with our sales team on each project, which often leads to working directly with the customer. Initial CAD models are developed, reviewed internally and with the customer, feedback is received, and changes are made before drawings are prepared and samples built. This process is repeated as needed until the customer approves our design solution. Q: What makes Vulcan so good at doing what it does? William Hutson: At Vulcan Industries, we go to work every day with a desire for continuous improvement through the implementation of our Lean Business System. We begin by obviously trying to hire the best people, and then we make sure they’re trained. Not only trained initially but as updates come and things like engineering software are revised, they’re given training on all those updates. We have our basic goals and also some stretch goals. Everyone is working on those goals as a department and as individuals to continue to improve and stay on top of what’s going on in the marketplace so that we’re as prepared as we can be. We add to our investment in process and people with investments in state-of-the-art manufacturing equipment. 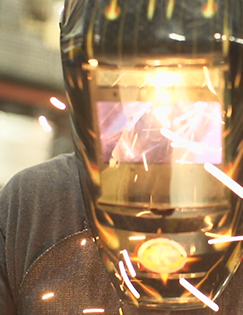 We invest significant money into making sure we have the latest in whatever it needs to be … welders, laser cutters. We’re updating our paint line with the latest and greatest equipment. We’ve got really good manufacturing personnel and good engineering. We’re up on the latest techniques for manufacturing parts so that they’re stronger, less waste, and hold up better. Q: What kind of sustainable practices does Vulcan employ in its engineering and manufacturing processes? William Hutson: Number one, we recycle all of our waste metal. We’re cutting parts out of big sheets of steel. We do our best to optimize it, but there’s always some scrap, and we recycle that scrap so it doesn’t just go into a landfill. For our steel, we go through a recycler, and they turn around and sell it back to refineries to re-smelt it and create more steel. We take steps to reduce our electricity usage at the plant with specific equipment to allow overall Lean energy. We paint our own parts in-house, but it does use some water, and the water that comes out when the process is finished can be dumped right into the city’s storm system. It doesn’t have to be specially treated or anything like that. We have EPA and OSHA approvals to do that because we use a low-phosphate paint system. Vulcan does try to be as green as possible and protect the environment when we can. Q: Can you tell us a bit more about the philosophy behind such practices? William Hutson: Well, there are three big reasons why we do what we do. Some of our customers demand it. For instance, Coca-Cola is one of our clients, and they’re very interested in sustainability and protecting the environment, not only for themselves but also for their partners who are providing displays and other materials. Two, it saves us money. There’s an investment up front, but in the long run [Lean manufacturing] helps us be a more efficient company, and a by-product of Lean is saving money. At the end of the day, the parts we produce are less expensive, so we’re able to pass on the savings to our customer and it’s a lower overhead for us. It’s a win for everybody. And the third is it’s a good marketing tool. Being able to talk about those things we do sometimes give us a competitive edge. Q: I figure Vulcan’s reputation helps attract top engineers? Jim Bell: Being well-known in the industry has helped bring top-quality engineers to VI. For a project engineer to be able to design a product, develop a sample, and be involved in the manufacturing of that product provides a positive learning and developmental experience for that individual. An expert in the field of creative retail-display solutions since 1948, Vulcan Industries engineers and manufactures custom fixtures for retailers and suppliers of consumer products. With our decades-long history of designing and building quality displays and our commitment to staying at the forefront of technology, you can be assured of seamless project execution from start to finish.